Ding Dong Merrily on High arranged by Martha Mier. For Piano. Duet or Duo; Piano Duet (1 Piano, 4 Hands). Christmas; Winter. Intermediate. Sheet. 8 pages. Published by Alfred Music (AP.18977).ISBN 0739003720. 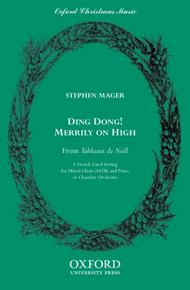 Christmas; Winter.Martha Mier takes this famous French carol and infuses it with ringing bells shifting between players. Descending one octave scales written as melodic ostinato patterns make this joyful arrangement very accessible for players at a mid-Book 3 method level. The key of C Major allows for easy reading for both primo and secondo players. Solid half note and whole note harmonies in the left hand allow less experienced players to focus on the flowing, rhythmic melody. Ding! dong! 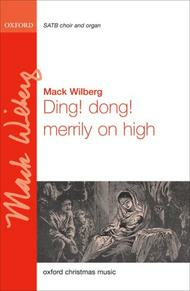 merrily on high composed by Mack Wilberg (1955-). For SATB choir and piano 4 hands/orchestra (piccolo, 2 flutes, 2 oboes, 2 clarinets, 2 bassoon, 4 horn, timpani, 3 percussion, handbells (optional), harp, strings). Mixed Voices. Christmas, Choral Leaflet. 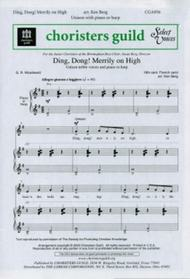 SATB vocal score (piano 4 hands version). 12 pages. Duration 5'. Published by Oxford University Press (OU.9780193870499).ISBN 9780193870499. Christmas, Choral Leaflet.For SATB and piano four hands or orchestra. Wilberg's masterful arranging is evident in this light and fun setting of the well-known traditional carol. With staccato chords in the piano on and sometimes off the beat, Wilberg creates a playful setting that will delight singers and audiences alike and which is ideal for Christmas concerts. Ding! dong! 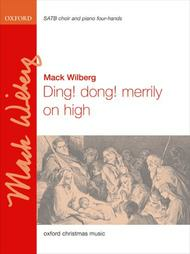 merrily on high composed by Mack Wilberg (1955-). For SATB choir & organ, or piano 4 hands, or orchestra (piccolo, 2 flutes, 2 oboes, 2 clarinets, 2 bassoon, 4 horn, timpani, 3 percussion, handbells (optional), harp, strings). Mixed Voices. Christmas, Choral Leaflet, Sacred. Vocal score (organ version). 16 pages. Duration 5'. Published by Oxford University Press (OU.9780193804869).ISBN 9780193804869. Christmas, Choral Leaflet, Sacred.for SATB and organ, or piano four hands, or orchestra The new organ accompaniment was transcribed by Peter Stevens for the King's College, Cambridge Nine Lessons and Carols service in 2007. The organ part is presented under Wilberg's original choral parts for an effective alternative to the already existing version for piano four hands. Orchestral material is available on hire from the publisher. Ding dong! 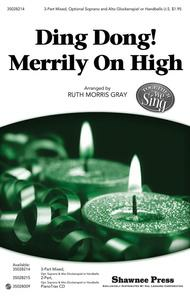 merrily on high composed by Stephen Mager. For SATB choir and piano/orchestra ([1, 2, 1, 1-2, 0, 0, 0-2], percussion, harp, strings). Mixed Voices. Christmas, Choral Leaflet. Vocal score. 16 pages. Published by Oxford University Press (OU.9780193863200).ISBN 9780193863200. Christmas, Choral Leaflet.For SATB and piano or chamber orchestra. The arrangement is inventive and sensitive to the original, with easy vocal parts and colourful orchestral parts. A version for SSA is also available. Ding Dong! 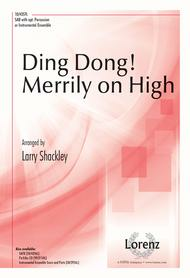 Merrily on High composed by Larry Shackley. For SAB choir and piano. Christmas. Octavo. Published by Lorenz Publishing Company (LO.10-4357L).This lively French carol receives a fresh, rhythmic treatment in an original setting by Larry Shackley. The optional instrumentation provides a mix of Renaissance and modern sounds, creating a buoyant sense of joy and celebration. Ding Dong! Merrily on High arranged by Ed Lojeski. For Choral (SATB). Choral. 16 pages. 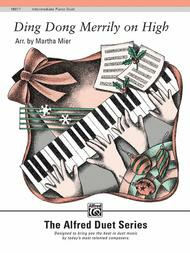 Published by Hal Leonard (HL.8402361).A delightful setting of this appealing dance carol! Ed has developed a wonderful madrigal-style extension to the traditional melody, and counterpoints it all with “Good King Wenceslas”. Excellent for all ages! Available: SATB, SAB, SSAA. Performance Time: Approx. 2:20. Ding Dong! Merrily on High composed by Ken Berg. For unison voices (with optional harp). Select Voices Series. Sacred Anthem, Christmas. Octavo. Published by Chorister's Guild (LO.CGA956).This light, joyous arrangement of the familiar carol will add charm to any Christmas service. The repetitive phrases and familiar tune give the singers a chance to focus on singing long phrases and beautiful vowel sounds. 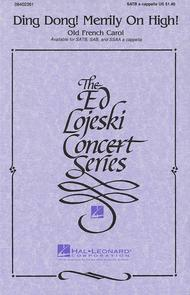 A challenging, spirited accompaniment adds to the excitement of the piece that's sure to delight all those who hear it.